The term sloppy advertising is a rather broad one, and out of date posters splashed over telegraph poles and lampposts certainly aren’t the only kind out there. Typos, inconsistent messaging and overrunning PPCs could all easily share this title (and there are plenty more!). However, what makes out of date advertising that has been left to fend for itself in the public eye so interesting is the negative and positive effects it can have. Does it reflect adversely on the business behind it, or could it actually be of any benefit to a company and their advertising efforts? As you will be able to see from the poster featuring at the beginning of our blog, the advertised circus (much like our hot weather) has unmistakeably been and gone – and yet it could be argued that it may still be serving a beneficial purpose. So what is this purpose we hear you cry! Well, it could (emphasis on the could) be seen to be acting as an unconscious reinforcement of a brand, causing individuals to open up a dialogue with someone about the circus, therefore keeping it in conversation. Similarly it could also be seen as a long lasting reminder; one that ensures, simply by just being there, that the event, even when it’s over, remains in people’s minds – including those that did not attend. So while there may be some positives (well we had to keep the blog interesting didn’t we?) there are also many pitfalls that come with the decision to abandon your advertising. Old posters may well be a reminder in some respect, but given that the information displayed is essentially irrelevant (and has been for over three months!) this can end with members of the public – including our poor Marketing Exec Alex – being misled about when the circus is really taking place. This sort of inconsistency can easily lead to confusion, which ultimately damages a brand’s reputation considerably – at Shine we really don’t trust the old adage that ‘any publicity is good publicity’! What’s more, if a business is happy to just leave their advertising behind then what does this say about their customer service – is it just as inattentive? We think it creates a perception that carelessness runs throughout the business. If they are not concerned about simply taking a poster down, then it’s not too far fetched to think that the event, product or service being advertised may not be up to satisfactory standards. Sloppy advertising could also be easily perceived as poor marketing, as it appears the business behind our featured poster has abandoned all its marketing efforts now that the trapezes and tightropes have been loosened! We think that if a business is willing to spread advertisements far and wide as part of a marketing campaign then they should also be prepared to organise a process to remove them afterwards. Leaving out of date posters for all to see reflects poorly upon a business or brand because it communicates a lack of attention to detail – and above all, a lack of care. Not to mention the fact that these sorts of posters are also untidy and subsequently look unprofessional, which could then cause people to question a business’s validity – a negative impact made worse by the fact that these unsightly views could have been easily avoided! 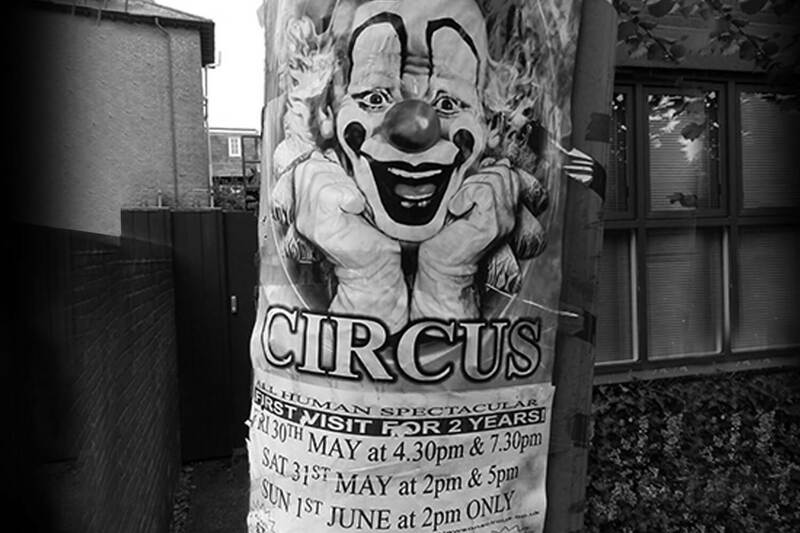 And yet, as our office discussions come to an end, and Shine unite against sloppy advertising, our local poster remains to be slowly eradicated by the weather – although, if it means the scary clown might disappear – we may not mind so much!